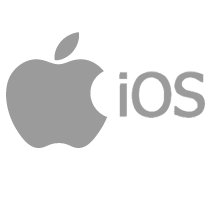 iOS is a mobile operating system created and developed by Apple. It is used exclusively for Apple devices and is the second most popular mobile operating system in the world, after Android. iPhone OS was revealed the first time in 2007 and it was designed originally for the iPhone smartphone, but it has been extended lately to support other Apple devices such as: iPod Touch, iPad and iPad Mini. The iOS user interface uses multi touch gestures, along with interface control elements consisting of sliders, switches and buttons. Also, the UI is based on the concept of direct manipulation and the interaction with the OS includes swipe, tap and pinch gestures. Internal accelerometers are used by some mobile apps for rotating the device in three dimension (switching between landscape mode and portrait mode for example) or for shaking it. Get in touch with us for your iOS development needs!